Were Activision to pass on creating a Call of Duty-based film, it would be leaving millions on the table. Not their style. That's why more chatter about a possible Call of Duty doesn't surprise, especially coming from "Soap" MacTavish himself. No, not the video game character. We're still pretty good at discerning reality from fantasy. 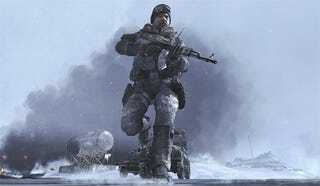 The voice of "Soap" in Call of Duty: Modern Warfare 2, actor Kevin McKidd, tells the New York Post that "there are talks of a feature film" based on the franchise. Which is hardly concrete, but backs up previous speculation that, yes, a Call of Duty movie is happening. Is A Call Of Duty Movie Really Happening? It's not really a question of if, but when, especially if Modern Warfare developer Infinity Ward has more time on its hands to dedicate to side projects.